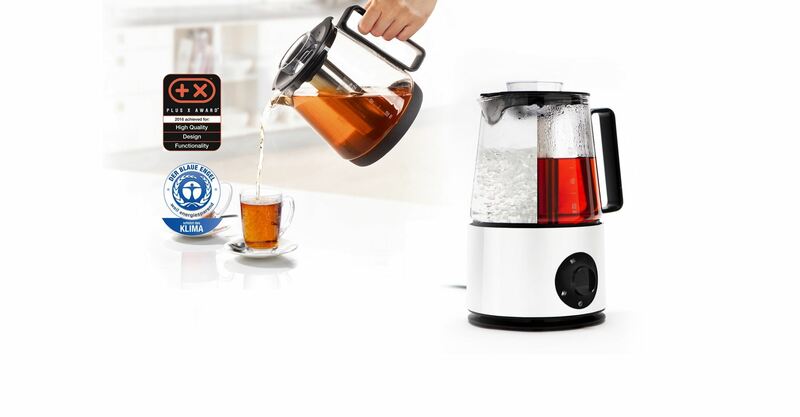 The induction Water & Tea Cooker combines the features of a water kettle and a tea cooker in one. Different tea flavors such as Black, Green, White, and Oolong tea require exact temperatures to allow their unique flavors and aromas to be develop during brewing. The cooker has 4 different temperature settings (70°C, 80°C, 90°C and 100°C) to perfectly brew your favorite tea and keep it warm at this temperature for 30 minutes. The high quality (Schott Duran) glass jug is dishwasher safe and therefore easy to clean. Prevent limescale, tea stains and to maintain its shiny look. The glass jug can be removed completely from the heating base and you can pour your tea and place the glass jug, which becomes a stylish tea pot, directly on the table. The lid is equipped with a refill opening so it’s very convenient to fill the stainless steel tea sieve with tea herbs. You can of course remove the tea sieve and boil water only. The Water & Tea Cooker combines efficient and powerful patented induction technology with userfriendly features. This unique product involves an in-house development of CQ that brings water kettles/ tea makers to the next level. The first models including this patented technology will be launched on the market under the brands Princess and Petra end of 2015.